Watt density and its importance for brewery immersion heaters - Process Heating Services Ltd.
Have a little look at the general watt density explanation, which can be found HERE. In terms of brewing, the higher the watt density, the higher the temperature of the sheath and consequently the more your wort, hops, etc are going to stick to that element. This starts an unfortunate snowball rolling downhill. As “stuff” sticks, the heat being produced by the element cannot dissipate (or get away) so the element sheath gets even hotter, and more “stuff” sticks. This explains the importance of cleaning any crust off your elements as, once its there, it’s only going to get worse, until it kills the element. Unless you get it off. Which may explain why one brewer told me today that he’d been advised to spend 45 minutes cleaning EACH ELEMENT of his heaters. WOW, 2 hours & 15 minutes to clean one immersion heater. Every brew. We need to bring back child slavery or expand the Apprenticeship system for this investment of time and labour to be viable!?! I’m all for advising you to look after your stuff, so you don’t have to speak to me too often, but 135 minutes? Having spoken to many a brewer over the last few years (it seems to be the only expanding area of production industry, due to that little quirk of the tax & vat laws, long may it continue), it seems that everybody cleans a different way. I’ve heard of toothbrushes, scouring pads, lemon juice & other mild acids, mild alkali products, jet washing, steam cleaning & even the cleaning fairy. Whatever works for you. So, to sum up, we have to keep the watt density down, while giving you brewers the heating power you crave, to get up to temperature as rapidly as possible. Cleaning time is wasted brewing time, but keeping the elements crud free will extend the working life considerably. So how do we address these issues? By giving you, the brewing customer the relevant, educational information and a range of alternative solutions, to suit different pockets and different levels of urgency of need (ie, if you’ve boiled dry and blown a heater up and are unable to brew, meaning you want it yesterday, or if you are planing an upscale to greater brewing capacity, and can wait a couple or 3 weeks for delivery of something tailor made). We used to sell a lot of PIH heaters to brewers, and still do for those that want like for like replacements, but the half inch elements do not have much of a gap between them, for scrubbing purposes. Italian, pricey, but rock solid. 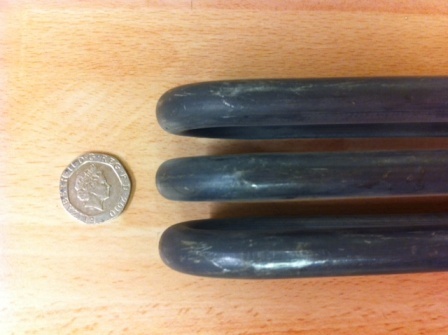 So we introduced the PCAB range (Process Calorifier And Brewery) with 10mm elements and a bigger gap. Nice to clean 10mm elements, again Italian, so unfortunately no flexibility on lengths, etc, as we have to buy in 20’s. Then we had the bright idea of tweaking the bends on our PII range (8mm double looped elements = almost twice as much element in the immersed length available) to make the upward leg flex outwards after insertion through the weld boss. Could be flexed up to 30º, but hot element MUST remain in solution at all times. 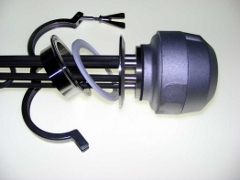 Also, being available bespoke in 2 weeks allows us to maximise the amount of element squeezed into your tank. Finally, what we consider to be the optimum solution, but will require new tank fittings as it is not a 2.25″BSP fitting. The PIR Range is a removable immersion heater, allowing you to remove the whole unit between brews, for cleaning purposes. Bespoke to maximise power and minimise watt density, 2 week leadtime. Slightly increased costs will more than pay for themselves in the ease & speed of cleaning, and resulting extension in working lifespan of the heater. Whichever option tickles your fancy, or if you just want to ask a question, or perhaps you want to report a sighting of the Cleaning Fairy, call me, Jamie, on 01827 703228. 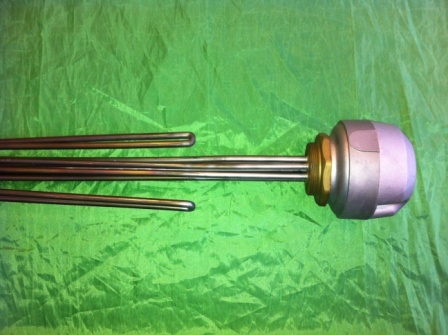 ← How to wire an immersion heater.